I've recently read David W. Anthony's book The Horse, the Wheel, and Language, and I especially appreciated his clear explanation of the complex world of Eastern European and Central Asian archaeology. There's a lot of new and relevant information, but you really do need a good guide — the facts and conjectures are complex enough, but the difficulty is multiplied many fold by the evolved disciplinary nomenclature, which is sometimes so baroque as to defy parody. The Cucuteni-Tripolye culture occupied the frontier between Old Europe and the Pontic-Caspian cultures. More than twenty-seven hundred Cucuteni-Tripolye sites have now been discovered and examined with small excavations, and a few have been entirely excavated (figure 9.1). The Cucuteni-Tripolye culture first appeared around 5200-5000 BCE, and survived a thousand years longer than any other part of the Old European world. Tripolye people were still creating large houses and villages, advanced pottery and metals, and female figurines as late as 3000 BCE. They were the sophisticated western neighbors of the steppe people who probably spoke Proto-Indo-European. Cucuteni-Tripolye is named after two archaeological sites: Cucuteni, discovered in eastern Romania in 1909, and Tripolye, discovered in central Ukraine in 1899. Romanian archaeologists use the name Cucuteni and Ukrainians use Tripolye, each with its own system of internal chronological divisions, so we must use cumbersome labels like Pre-Cucuteni III/Tripolye A to refer to a single prehistoric culture. There is a Borges-like dreaminess to the Cucuteni pottery sequence: one phase (Cucuteni C) is not a phase at all but rather a type of pottery probably made outside the Cucuteni-Tripolye culture; another phase (Cucuteni A1) was defined before it was found, and never was found; still another (Cucuteni A5) was created in 1963 as a challenge for future scholars, and is now largely forgotten; and the whole sequence was first defined on the assumption, later proved wrong, that the Cucuteni A phase was the oldest, so later archaeologists had to invent the Pre-Cucuteni phases I, II, and III, one of which (Pre-Cucuteni I) might not exist. The positive side of this obsession with pottery types is that the pottery is known and studied in minute detail. Mark, I this had me belly laughing. I cannot begin to explain the hopelessness that I sometimes feel as a student of archaeology. The focal vocabulary used by archaeologists is not only complex and precise; but it almost always reflects the language of the region being studied. Sorry prof; I don't speak Nahuatl! I too have been reading this book. Not every word of it, but as much as I was interested in, principally his argument that the speakers of proto-Indo-European lived at the northern ends of the Black Sea and Caspian Sea about 3500 BCE and therefore it's worth comparing what is known about the language with what can be discovered about the people from archeological remains. But much of the detail was above my head. Am I right in thinking his basic argument is sound (that proto-Indo-European was spoken where he says it was, and not, say, in Anatolia)? O, Be A Fine Girl, Kiss Me (Right Now Sweetheart). I am reading the book, too, and appreciate the lucid exposition of archeology (what really startled me is that Soviet and Western archeologists have different definitions for something as basic — you would have thought — as the Neolithic period). It's a shame the publisher couldn't find a linguist to proofread the first few chapters. Anthony freely admits he's not a linguist, but he has done a great job of summarizing the whole reconstruction thing for non-specialists. As a linguist, however, small mistakes in non-essential detail make me cringe (masculine/feminine/neuter "case", for example). I suspect that they came up with all those different Cucuteni classifications just because they enjoy saying the word Cucuteni. I had a similar feeling when I read Mallory's "In Search of the Indo-Europeans" (1989) and also other texts about linguistic prehistory. It is not easy for the non-archaeologist to follow the explanations of an archaeologist, especially when the author mentions dozens and dozens of different prehistoric cultures with various, sometimes quite diverging theories about them. When you read these texts you may have a glimpse of the general framework of the archaeological material, but a couple of days later you may have forgotten most of the details: What culture came before the other one? In what millenium did this material culture emerge? So it really takes great effort to read these texts and to try to understand the details, especially because the non-archaeologist lacks the appropriate context to evaluate the archaeological material. Now, is it really worth the effort? When I started to read Mallory's book, some years ago, I was still convinced that the traditional theories about Indo-European were valid. For me, Mallory's book could be a confirmation of these theories, especially the ones referring to the origin and chronology of proto-IE. As I read the book, I started to realize that the whole thing made little sense, and when I finished it I was quite sure that it was necessary to find other types of explanations for PIE. And that's what I did: try to find alternative ways. And in fact I have found many interesting things outside the traditional canon. I haven't read Anthony's book, and, from what I know about it, I think I'm not going to do so. I think the idea of a PIE homeland somewhere in Eurasia around 3500 BC is simply wrong. There's no doubt Anthony, as well as Mallory, are expert archaeologists with a lot to say about Eurasian prehistoric cultures, but the linguistic assumptions that they use are based on a dated approach. For someone like me, interested in historical linguistics and IE studies, it makes little sense to read about the archaeology of the steppes. I prefer to spend my time reading other things. Why, oh why, has noöne bothered to write a reviewarticle revising the nomenclature to fit reality? I now we chemists can be arcane, but at least we have IUPAC to sort this sort of thing out for us. @ Tim: Cucuteni has 3 syllables, the -i being a sign of palatalization. Apparently the name is derived from cucută "hemlock", which is cognate with the French word for that plant, ciguë (two syllables this time, as indicated by the tréma). Nigel, please don't ruin perfectly good fun with something as arcane as facts. If it comes through writing, there's nothing wrong with saying Q-Q-T-knee. My Ukrainian co-worker writes, "Just to make things even more complicated, the term Tripolye is actually Russian. The Ukrainian word is Trypillia. Until independence, all Ukrainian scholarly texts were Russified, and it's been hard to change that in the last two decades (even the capital, Kyiv, is still called Kiev internationallyl)"
The word Tripolye is semantically transparent for a speaker of a Slavic language, and can be translated as "three-fields". Quite likely it has something to do with the medieval method of cultivating the land, in which you divide your fields into three parts and in any given year each part had a different function (fallow land, arable land, pasture). Now you can think of a nice Borgesian story with three fields and hemlock. Oh, and pottery! Nothing like a good story based on facts. To Nigel Greenwood: actually, French "ciguë" is a semi-learned word, and thus is not a BONA FIDE cognate of Romanian "cucută". Whereas the latter word descends in fairly straightforward fashion from Latin CICUTA, the Old French form was "ceuë", which exhibits the normal reflex of intervocalic /k/ followed by a back vowel in Latin, as well as of intervocalic /t/ (i.e. zero in both instances): the Modern French form owes its /g/ to learned Latin influence. As an archaeologist, I can agree that this text might seem dense to an outsider, but in fact this quote concerns a very basic kind of "culture-history" discussion of what types of material culture were common in an area at specific times. A group of people at my university got together informally last week to discuss how archaeology and linguistics can be combined to understand prehistory. Most of us work in the Andes, and we used a series of articles by Heggarty as a jumping-off point. We ended the discussion fairly depressed. It seems that most academic disciplines are now so specialized that an outsider cannot hope to master enough of the ambiguities and cutting edge work in another discipline. Thus, articles by linguists elide crucial archaeological details and vice versa. Also, attempting to match archaeological "cultures" to the spread of language families in the absence of texts is problematic at best. Archaeological "cultures" are time/space specific distributions of styles in material culture, usually pottery. This is not directly linked to language; certainly the appearance of Chinese porcelain western Europe was not accompanied by a spread of the Chinese language to that area. Many people have tried to match up particular archaeological "cultures" with language expansions in time and space, but given the uncertainties in dating it is fairly circular to argue that these correspondences are causally related. Furthermore, there is no reason to believe that archaeological "cultures" or even prehistoric polities were monolingual. One useful suggestion for interdisciplinary work was that, rather than attempting to master another field of knowledge, specialists in each field should work together. So I have a question for linguists about the spread of Indo-European or any other expansive language family. Let's set aside for the moment the search for a particular "culture" that acts as the motor for the spread of a language into a new area. What are the potential *mechanisms* for an outside language to supplant a native language in an area? Conquest, mass migration, and state-sponsored primary schooling are not particularly plausible in the case of either the Indo-European or the Quechua family expansions. So what does that leave us? What are the ethnographically documented ways a language takes over as the preferred native language of an area? Systematic intermarriage? (eg: always marry a woman from the east and a man from the west) Are there circumstances under which a lingua franca displaces a native language? Why does replacement result rather than bilingualism? If agriculture is the mechanism for IE, why and how did this cause a displacement of native languages? We need to think more critically about the mechanisms by which children would grow up speaking a new language to the exclusion of their parents', and how this might be visible archaeologically. I'd love to hear what linguists have to say about this. Are you sure the reference to masculine/feminine/neuter "case" is an error, and not merely cases created as a challenge to future linguists? "Am I right in thinking his basic argument is sound (that proto-Indo-European was spoken where he says it was, and not, say, in Anatolia)?" I think there is still a good deal of dispute about exactly where the PIE "homeland" was situated, and there probably will always be. 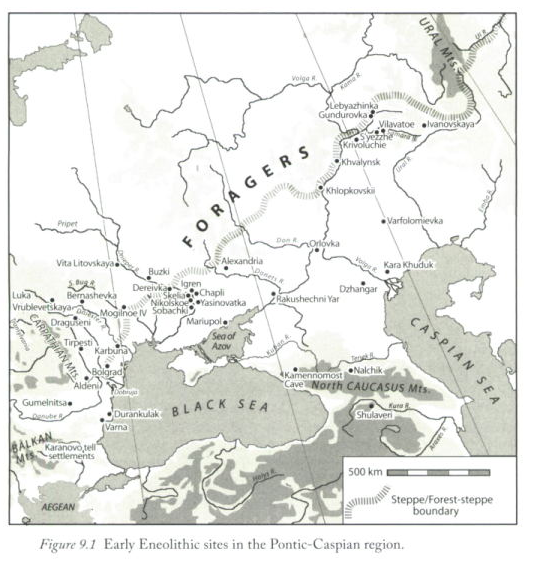 It seems to me that the Pontic Steppes are a very plausible but not water-tight candidate. I feel Anthony's explanation for the spread of Indo-European languages into eastern Europe ("franchising") is speculative though intriguing and not implausible. His explanation for the spread of Indo-European language into Anatolia ("migration by boats") seems less plausible. My own sympathies lie with "pottery doesn't speak; people do" skepticism. I'm inclined to think that the spread of cultural artifacts doesn't necessarily line up with the spread of languages. Maybe one of the historical linguists who frequent this site could comment (though I could understand why they might be unwilling to step into a scholarly controversy in an informal context). As a person without an extensive background in linguistics but a lively interest in the topic, I'd appreciate it if someone could point me to any balanced and informed critical reviews, especially readily accessible ones. I couldn't agree more, and think that cross-discipline collaboration is the answer to research that calls for expertise in two specialized domains. As to the answer of how one culture's language gets supplanted by another, that's certainly a subject that has been studied in modern contexts, although it's not my area of expertise. The most commonly observed in modern, documented mechanism that I'm aware of is that economic/socio-political power. The basic scenario is that within an area of linguistic diversity, one language community rises to a degree of prominance that its language becomes the primary means for cross-cultural interaction for trade or diplomacy, eventually eclipsing the area's other languages' perceived usefullness within their own communities in favor of the lingua franca. This primacy can be acheived through force, economic power or any other variety of mechanisms. I have no real idea what archaeologically visible outcome this transition might have, but there are plenty of examples documented throughout history (e.g. Latin's rise within the Italian peninsula and beyond, Spanish's spread through the New World, French's spread in Africa, English's spread in North America or Australia or wherever, etc. ), all with variations on the factors involved. As I said this isn't my area of specialty in Linguistics, so if I have my details wrong hopefully someone with a stronger grasp of the facts can correct me, but this is the basic pattern as I understand it. "We need to think more critically about the mechanisms by which children would grow up speaking a new language to the exclusion of their parents', and how this might be visible archaeologically. I'd love to hear what linguists have to say about this." Disclaimer: I'm not a linguist. But I question whether there can be any valid generalizations about the process of language replacement–I suspect that each situation presents a unique set of facts–and I'm highly skeptical that in the absence of a written record archeology can reliably tell us much about the dissemination, replacement and death of languages, especially at remote time-depths. The problem I have with the book is the sloppiness of the writing, which affects both the linguistic and archaeological portions. I am an Indo-Europeanist by training and inclination, with a fairly good grasp of archaeology as well. There are many errors in the book that should have been caught by any competent editor, and this sloppiness of presentation makes me less than enthusiastic about the conclusions–even though I would like to accept them. A couple of examples of this extreme sloppiness will demonstrate my concern. Both in the text and in his bibliography, Anthony refers to the eminent linguist (and first propounder of the Indo-Hittite hypothesis) Edgar P. Sturtevant as "William". In the text, he refers to the phylogenetic work of "Wendy Tarnow", although he does at least get Tandy Warnow's name right in the bibliography. Some of the linguistics is equally sloppy (beyond referring to gender as case), and typographical errors abound. This makes me wonder about the care given to the arguments themselves, and saddens me for the difficulties they may cause the next writer on the topic. Y'all have left one important leg of the tripod on which prehistory can stand: genetics. Cavalli-Sforza and his students. Linguistics + archaeology + genetics is, at this point, the best we can do to reconstruct a past without texts. It isn't optimal to use just two data sources out of the three available. Not to say that the genetic studies are always reliable, but then, neither are the other disciplines. Zora, I happen to know a little bit about the efforts at reconstructing prehistory in Alaska, and I can vouch that archaeological, biological (which is more than simply genetic evidence, although that is included), and linguistic accounts have all been considered. They often seem to be completely unrelated to each other, with a handful of happy agreements, which makes me, like many others here, highly skeptical of any necessary relation between the three. However, I do happen to feel that the general subject is worthy of investigation- every now and then we do get lucky, and can learn something productive from comparing different lines of research. We just have to be realistic about how limited such comparisons are. lex: …attempting to match archaeological "cultures" to the spread of language families in the absence of texts is problematic at best. Archaeologists have therefore rejected the possibility that language and material culture are correlated in any predictable or recognizable way. Robust, persistent, material-culture frontiers are not found everywhere, so only exceptional language frontiers can be identified. But that, of course, is better than nothing. I've elided all the details — see the book for the body of the argument, and for Anthony's discussion of the connections of gene flows to all of this. I'm not saying it's Hemingway, but this passage hardly seems to me to qualify as an example of an "evolved disciplinary nomenclature, which is sometimes so baroque as to defy parody." It seems pretty straight-forward–if not gripping. The names of the culture and the sites are just names; they might be unfamiliar to those (like me) who aren't mavens of Eastern European archaeology, but that doesn't make them an "evolved disciplinary nomenclature." I count only two terms of art: "pottery sequence" and "phase." And even there, it seems the author's point is understandable even if you only intuit what a "pottery sequence" is because his point seems to be to mock the "evolved disciplinary nomenclature" pretension to precision. "The second regularity is more important: language is correlated with material culture at very long-lasting, distinct material-culture borders. […]"
When I read the book about a year ago, I wasn't entirely comfortable with these generalizations and the notion of long-lasting robust frontiers. As I recall, there is some research backing up these generalizations, but I'm still a bit skeptical that human history (or pre-history) has invariably flowed in predictable patterns like this, particularly in the remote pre-literate past. [(myl) With respect, does your recollection of non-specific discomfort rise to the level of information that the rest of us need to know about? Also, let me point out that "is correlated with" does not imply "has invariably flowed in predictable patterns like this". On the contrary. @Nigel Greenwood (February 9, 2009 @ 6:46 am): The trema in French ciguë actually indicates that the word has three syllables — the third one just happens to be mute… This is anomalous (to say the least), and since 1990 the recommended spelling has been cigüe. But it really hasn't caught on. "With respect, does your recollection of non-specific discomfort rise to the level of information that the rest of us need to know about? "Also, let me point out that "is correlated with" does not imply "has invariably flowed in predictable patterns like this". On the contrary. "It would be relevant and helpful here to say something like "Anthony only cites N examples of 'robust frontiers', which is too few to be convincing; and I can think of the following cases where his generalization is wrong; etc." But "I dimly recall reading this and not being convinced" is only of interest to your biographer." I'm not sure why my comment was singled out for a sharp and stinging rebuke when so many others have posted utter nonsense. I apologize for failing to measure up to the standards of scholarly precision required for posting comments on this site. But you can rest assured that from now on I will stop reading and posting comments on this site. To John Cowan: What is a class S star, and what does that have to do with this topic? Michael Maxwell: If I remember correctly, class S stars are on the borderline between carbon stars and class M. The Wikipedia article goes into a lot of detail that is partly over my head, stellar classification having changed quite a bit since I last studied it. Originally, the classification was simply A, B, C, …, but later discoveries caused the order to become scrambled. I was (much too tersely) trying to compare this situation to the situation with the Cucuteni phases described in the quotation above.